With the rising costs of life in general, everyone is looking to save a little green these days. A major expenditure for most of us are our home energy bills. By using technology, common sense and constant awareness of power consumption, we can help you reduce your home energy costs. To start a low-power diet, most assume it will be a disruptive formula, much like cave-dwelling and technological darkness. With our tried-and-true methods, you can slash those bills for good, with minimal disruption. While these are strategies most have heard before, they should also be common practice. Instead of rehashing the basic strategies listed above, we want to focus on methods that are less obvious but offer more cost savings. For ease of use, we have divided our 10 methods into categories based on skill level and approximate cost: easy ($), Intermediate ($$) and Advanced ($$$). Obviously, the higher the difficulty, the more effort is required. However, it also offers a higher cost savings. 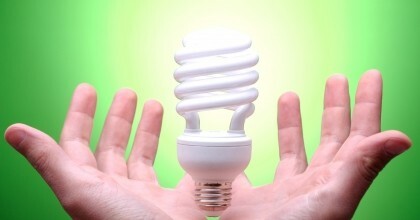 No matter your choice, integrating any of these options will help reduce those energy bills! Most bathrooms and kitchens have 2 to 4 bulbs each, which with standard light bulbs makes for 120 to 240 watts of wasted electricity per hour. By switching to compact fluorescents (CFL) or the even better LED bulbs, you gain bulb lifespan in addition to a watt reduction to 20 to 50 per hour. Timers and even remote controlled switches can all aid in these cost reductions by preventing sources from running at full wattage or while not being used. That treadmill in your room? You know, the one that only saw use from January 1st to January 15th? Just by being plugged in, it is drawing power and costing you money. Same goes for all of the video game consoles and DVD players. By evaluating what you use, and how you use it, you can better correct these wasteful charges. By implementing a dedicated power strip to similarly used items, it will become easier to turn them off with the push of a button. Simple fixes like frequent air filter changes can help make a dent in your energy costs, but going one step further by utilizing ceiling fans to help keep air circulating can help regulate temperature. With all of the joys that central air can bring, it can often be inefficient in maintaining a consistent air temperature. Employing the use of fans will not cool the air, but they will help keep the heat from rising up and out during the winter. It is important to show your HVAC system a little love through the years. Having vents cleaned can help significantly reduce allergens as well as ensure that all vents are disbursing air as they should be. In addition to having your vents cleaned, it also bears mentioning that all vents should be inspected to be sure they are, in fact, open. It is a common myth that shutting certain vents helps to reduce costs. In actuality, it forces the HVAC unit to work much harder to divert that air to only the open vents, thus running more frequently and for longer durations. Thereby, costing you more money. Before you go looking for a certain pink panther, take inventory and devise a plan for insulation, as there can be too much of a good thing. Insulation is a double-edged sword that is a little bit of a balancing act. Too little and you open yourself up to astronomical energy costs. Too much and you risk problems such as mold and condensation. Both the basement and attic need to “breathe” so you do not want to over stuff the fluff. Check out Energy.gov’s helpful how-to-guide for insulating your home. If these areas are not a problem, other insulation options to consider would be insulating your hot water tank and also your pipes. This can be helpful in the winter months to prevent freezing, while also helping the hot water tank from having to work so hard to prep for your morning shower. One last insulation method to consider is area rugs. If you have hardwood floors, tile or slate, those winter months can be particularly tedious. By placing area rugs in open spaces with bare floors this can help seal heat in. One of the best ways to stay cool is to block heat from getting into your home in the first place. Installing leafy plants and trees around your home is a fantastic way to boost your curb appeal while reducing the amount of sun shining on your roof, a/c unit and into windows. Though the topic of lighting and smart bulbs were mentioned above, another great cost-saving option to lighting is the use of dimmer switches. These switches allow wattage to be reduced, but still functional. The romantic ambiance of a lower utility bill will have you falling in love with these switches. In this tech-advanced world, ENERGY STAR is all around us. We know all about energy saving washers, dryers, and refrigerators, but here are a few of the less obvious gadgets you could look to upgrade in the name of long-term savings. With Amazon Prime Day and “Black Friday” events, purchasing a new television is more easily slipped into a budget. Something to consider when buying though is size and type. Plasma televisions draw three times as much power as an LCD model. Additionally, the larger the TV, the larger the electric bill, even on ENERGY STAR rated models. Thermostats that can be controlled remotely are gaining popularity for good reason- they can save you big money. Understanding that weather predictions are just that, it is nice to know we live in a world where you can alter the temperature (and more!) from the tap of your phone. If you have spent the last few seasons caulking, taping and blow drying plastic. Now may be the time to consider the inevitable: replacement windows. Double hung and triple pane windows offer the biggest bang for your buck while sealing out the elements that contribute to rising costs. Windows by Erie offers a wide variety of styles to get you on the path to savings. The most drastic option of all in the name of long-term cost savings is considering a new roof. Similarly to the rationale for new windows, if you are seeing heightened energy bills, your roof could be the culprit. If you are seeing streaking, cracking, or peeling with loose or missing shingles, now is the time to consider a new roof. There are a vast majority of roofing options, but metal roofing offers the best recourse of ENERGY STAR certified options that have the proven longevity to keep you in the green all year long. For more on the full spectrum of roofing options on the market today, view our previous article: Anatomy Of A Roof. Having loaded your tool belt for energy savings, there are some tech-savvy ways to start your low-power diet today. As with any diet, you just need to get started to start seeing the results! Still have questions? Visit our “Ask The Experts” page for more information. If you truly want to get top dollar for your house in this economy, real estate experts say you need to attract the buyers. To do this, you need to make sure the outside of your home is attractive. Think about it, if the outside looks a wreck, why would anyone want to see what the inside looks like? When it comes to home maintenance, the outside is just as important as the interior of your home. Whether your house is on the market or you just want to rev up its curb appeal, consider an exterior update for your next home improvement project. There are lots of options to think about when choosing a disc cutter and it’s important that you make the right choice. The material you need to cut, the type of blade, how the cutter is powered and the depth adjustment options should all play a part in your choice of cutter. Disc cutters can be a really useful tool. They’re excellent at cutting through tough substances that an ordinary handheld saw just wouldn’t be able to get through, from concrete to some types of metal. However, there are different disc cutters available and they often have different specifications, so how do you know which would be most appropriate for you? Let’s take a look at some of the things you need to look for when you are choosing a disc cutter. No matter how much you love your home, you probably have a “fix-it” list. Small repairs can add up if you call in a professional, but you can save hundreds of dollars per year by doing it yourself. Many home woodworking jobs require little skill; here are four jobs that any homeowner can do. Woodworking is a rewarding and entertaining pass time. Not only is woodworking a practical skill that you can use to create wonderful and practical gifts and other objects, but it is an extremely pleasurable way to pass time and keep your hands busy. Woodworking is an excellent hobby, and starting woodworking is a great investment of you time. There are some essential things that you will need before you can begin woodworking. First, dictate a well lit and tranquil space to work in which you can concentrate and work in peace. Also, invest in some bright, high quality work lamps. There are also five essential tools that you will need before you can begin woodworking.